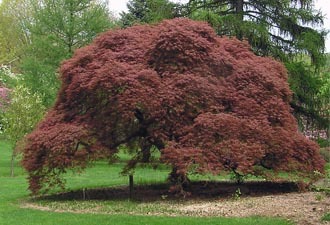 The David C. Shaw Arboretum which is located on 22 acres in Holmdel Park, Holmdel New Jersey, was started in 1963 with plantings of Crabapples, Cherries and Hollies. What started out with 87 trees now contains nearly 3000 trees and shrubs. Almost all of the plant material came to the arboretum through donations from local nurserymen. It has become a magnificent collection of trees and shrubs suited for the home garden to show what type of plant material will grow in the area and what they will look like at maturity. You will find many collections within the arboretum, such as the Handleman Garden which is a study in textures and contrasts with an emphasis upon broad leaf evergreens. The Alvarez Synoptic Garden consisting of groups of trees and shrubs arranged alphabetically by botanical names, along with the Jayne Kluis Dwarf Conifer Garden a collection of dwarf evergreens along with some larger conifers and deciduous plants to provide contrast. These gardens along with many others throughout the arboretum are wonderful place to visit any time of the year.